The friendly coastal town of Belmullet has much to offer by way of visitor and tourist attractions. Belmullet and surrounding hinterland is renowned for friendliness and hospitality and the relaxed pace of life that one feels after a short time in the area. The bordering Atlantic coastline, coupled with miles of unspoilt beaches and strands, have a major appeal for lovers of the outdoors. Enjoy a relaxing day on the beach, go for a swim or paddle in the ocean or take an energetic walk along the strand - whatever your pleasure you will feel energised and revitalised after a day by the seaside in Belmullet. 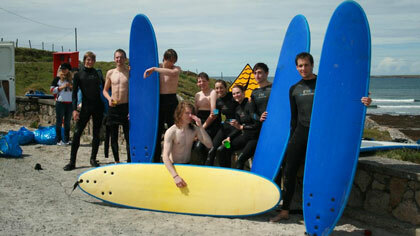 Watersports such as windsurfing, scuba diving, sailing, as well as trips to the nearby islands, are very popular activities in and around Belmullet. Carne golf course, open to non-members and visitors alike, is one of the most challenging 18 hole championship links in Ireland. Sea angling and fresh water angling in rivers and lakes are other major attractions in the Erris region - boat hire, licences and ghillies can be arranged locally.